The Free Russian Press in Bloomsbury. Sarah J. Young tells the story of how her research on nineteenth-century Russian émigrés and visitors to London led to the unveiling of a plaque to commemorate a remarkable episode in the history of Bloomsbury publishing and Anglo-Russian relations. It’s not often in my line of work (19th and 20th century Russian literature) that research has a concrete, physical and permanent (as far as anything can be) public outcome, so it was with great pleasure that, having collaborated on the research to establish precise locations, I was recently invited by the Marchmont Association to unveil a new plaque commemorating the work of the Free Russian Press at 61 Judd Street in London. 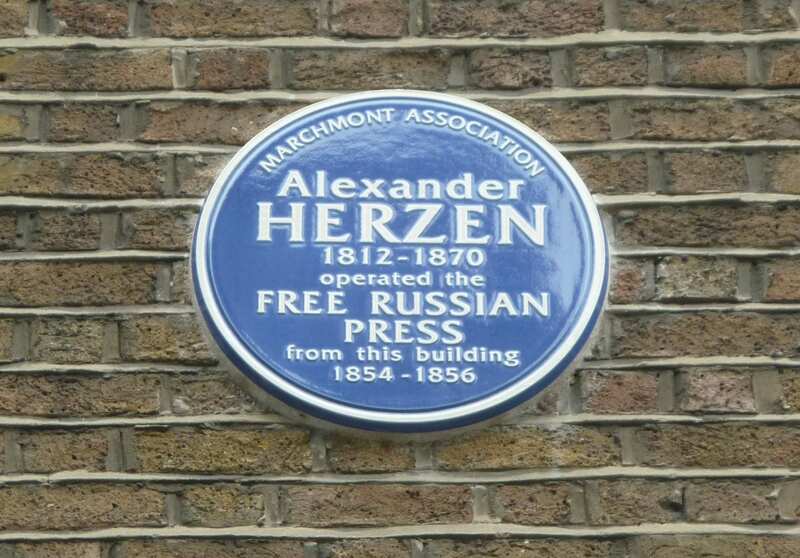 I first started researching the press for my Russians in London series, quickly realizing that the twelve years that the writer and publicist Alexander Herzen spent in London were central to the story of many of the other visitors I was tracking down. His importance as a point of contact – and as the beginning of the story of radical Russian émigrés in London – was primarily down to the significance of the Free Russian Press. The first of many Russian émigré presses, Herzen set it up in 1853 shortly after his arrival in the capital, disillusioned by the failure of the 1848 revolutions in Europe and reeling from a succession of family tragedies. The annual almanac The Polar Star – named after the journal produced by two of the Decembrist revolutionaries who had inspired Herzen in his youth – and the bi-monthly newspaper The Bell were published from Judd Street in the 1850s (the press moved to a new site across the road after establishing its first independent premises at no. 61, at the time 82 Judd St.), were probably the most influential publications in Russia. Thousands of copies were smuggled in to Russia through Herzen’s various contacts, and it was read not only by the intelligentsia or the radicals, but by everybody in authority, including the Tsar. In Herzen’s wonderful memoirs My Past and Thoughts, we read, ‘“The Bell is an authority,” I was told in London in 1859 by, horrible dictu, Katkov’, referring to the arch-conservative journalist and publisher of Dostoevsky’s novels. If such a notoriously reactionary figure was prepared to admit this, it can only mean that The Bell was indeed highly significant. I am utterly perplexed. The sacristan’s widow unthinkingly sent her son a one-ruble banknote not by registered mail, as required by law but in a plain envelope; at the post office the envelope was unsealed and, after the widow’s crime was uncovered, her missive was confiscated and she was subjected to a fine. It is no news to anyone that letters are opened and read at the post office; but just how is it that they intercept the widow’s banknote but not the Bell, which I get from the police chief? While this is obviously fictional, it is supported by what we know about The Bell’s readership. No doubt for some getting hold of it was a matter of knowing the enemy, while for others a frisson of danger derived from dabbling in progressive politics may have been a factor, but it does seem that whatever the motives, many of those involved in banning and policing the ban on Herzen’s publications were in fact simultaneously complicit in their distribution – an interesting case study for further research? Material for this post first appeared on Sarah J. Young’s blog. Sarah J. Young is a lecturer in Russian literature at UCL SSEES. She is currently working on a study of nineteenth- and twentieth-century narratives of prison, hard labour and Siberian exile. She blogs about her research and teaching at sarahjyoung.com. 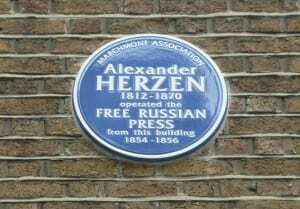 She will be talking about Herzen and the Free Russian Press at the Bloomsbury Festival on 20 October.